As a copywriter I’m asked to write about all kind of things. From credit cards to drainage pipes and baby soap. Lately I’ve noticed a trend whereby the email that accompanies the brief is apologetic. Maybe they think copywriters spend 80 per cent of their time skydiving and hanging out with rock stars (I don’t), but these apologies make me angry. Even if your business involves manufacturing the widget that gets glued to the oojamplip at the bottom of a grade 746J sprocket hole, someone cares. I care. And so should you. When you were so passionate about your business idea that you gave up your day job and took a leap of faith? When every new business email made your stomach leap with joy? Don’t lose that feeling. Ever. Never forget the passion and the fire you have for your business. And never apologise for what you do. Also, never describe your business as boring. Because there’s always an angle. There’s always something interesting to say. You just have to dig deep and find it. Here’s how copywriters unearth the un-boring, and how you can, too. We start by burrowing deep inside your potential client’s brain and watching them think. Then we take each of these and create a rational response to persuade them that, whatever the problem, your business is the solution. Another trick is to inject warmth, professionalism and even humour, where appropriate, into what we say. Being human beats boring every time. Next we simplify and clarify, cut out the useless, flabby copy flesh and get to the bare bones of who you are and why you’re better than your competitors. Often ‘boring’ businesses write more to try and justify themselves. But in reality, if your project is a little on the dull side, less is most definitely more. It’s all about communicating with your customers in a real, honest and open way. 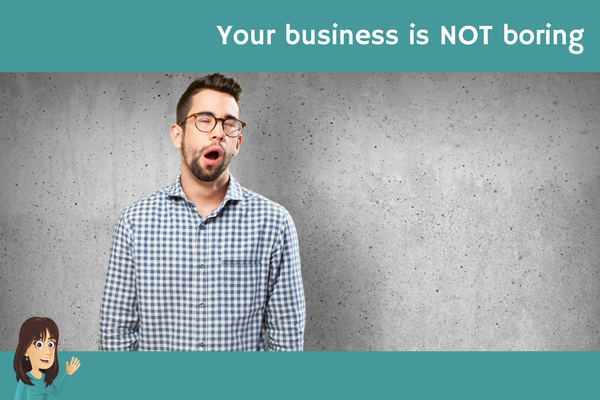 Do you think your business is boring? How have you uncovered its inner awesome?